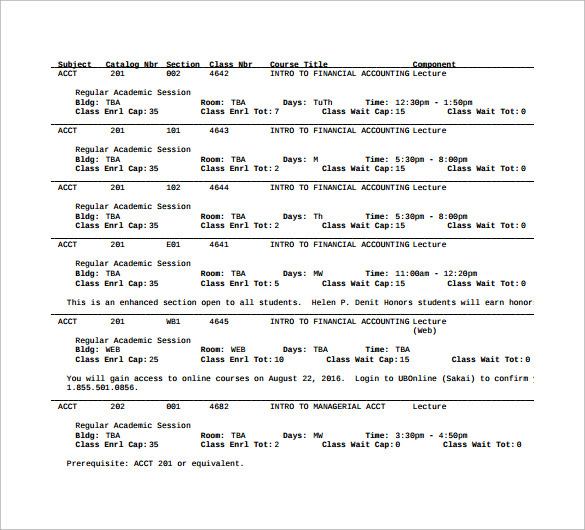 The purpose of this university schedule template is to help you manage the university classes. It is an instant way to plan the classes. 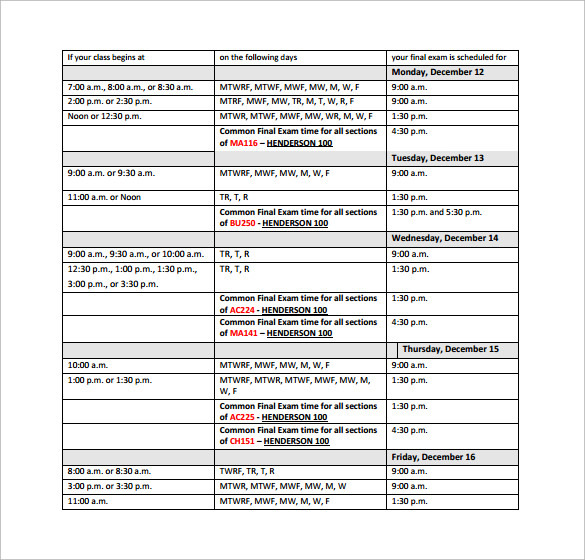 For every busy university teacher, this University Shift Schedule Template is quite effective. With the use of information being provided by the university dean, you can easily enlist the courses and options you want to offer to the students. 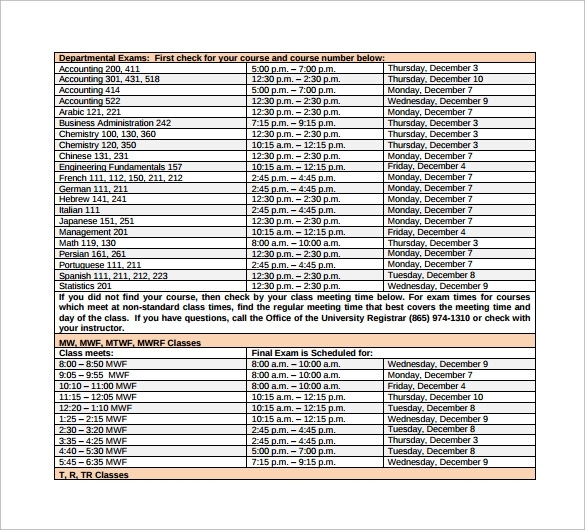 It would be a lot easier for you to include the Course Reference Numbers (CRNs), the course subject codes, and other necessary details in this university schedule template. When a course needs extra time, you can readjust the university schedule template as per your needs as it is editable and can even be downloaded. 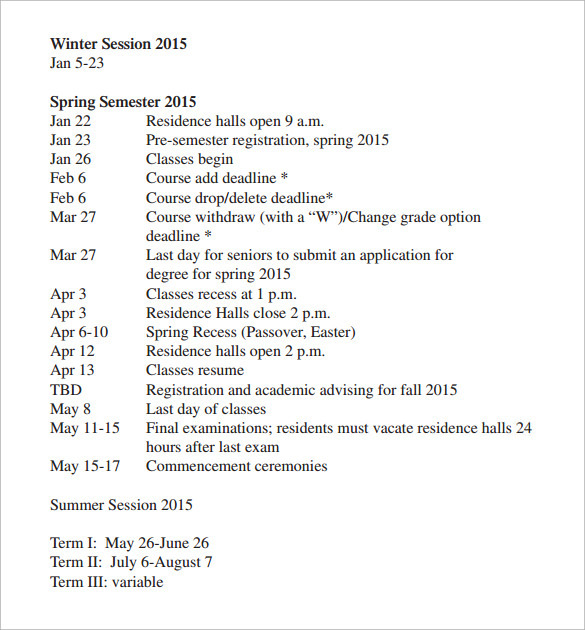 This is good sample for university schedule for entire year. It shows the date wise activity for a academic year in the university. 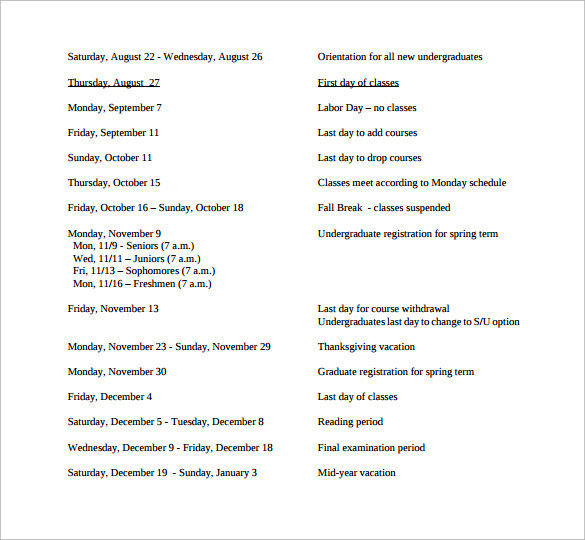 All other plans or schedules are to be made in university while considering this master schedule for entire academic year. This template is simple and designed in one page format for easy circulation and understanding. This template is very effective if you are looking for help while designing the timetable for the university. This template contains entire details about the lecture schedule and room and lecturer assigned to take the same. This template can be downloaded from here and post making the necessary changes the same can be published either on university website or on the notice board to help students about the session plan. Designed in simple excel format this template is very effective for university calendar. This university calendar template gives details about event to be held in university during academic year. There are month-by-month and date by date event mentioned in this template which will help teachers and students to plan effectively. This is very fine template for lecture scheduling in university. Since there are many medium of teaching in university so, this template will help students to make their plan for study according to this template. This template provides the details about the class timings for each topic and method of lecture for the same. Why We Need University Schedule Template? There are many schedule templates from year planner to classroom lecture planner given here. If you are involved in university schedule planning then these templates will defiantly help you in designing a perfect schedule for the each activity for entire academic year of the university. 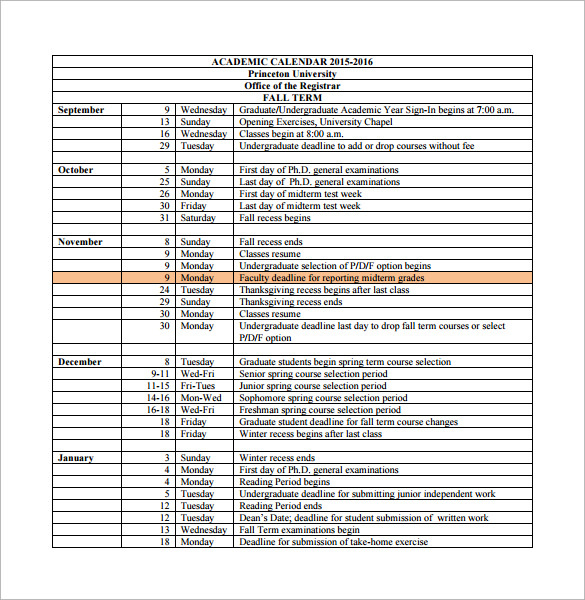 A good effective template to schedule various activities and lectures in the university is always required. 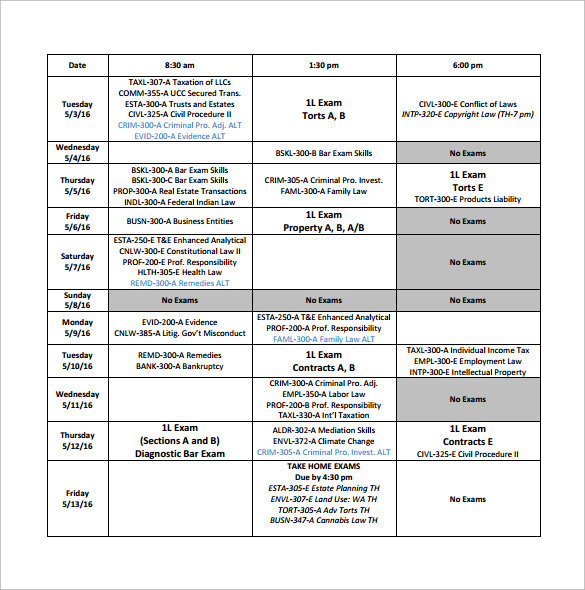 When We Need University Schedule Template ? The resource planning and time planning is a difficult task and once it’s done effectively at the beginning of the year, there would be a clear picture of the schedule and availability of resources for another events if required. The university schedule needed to be circulated among students and entire teaching and non-teaching staff of university so that they all will be aware about the activities and lecture planning for them. 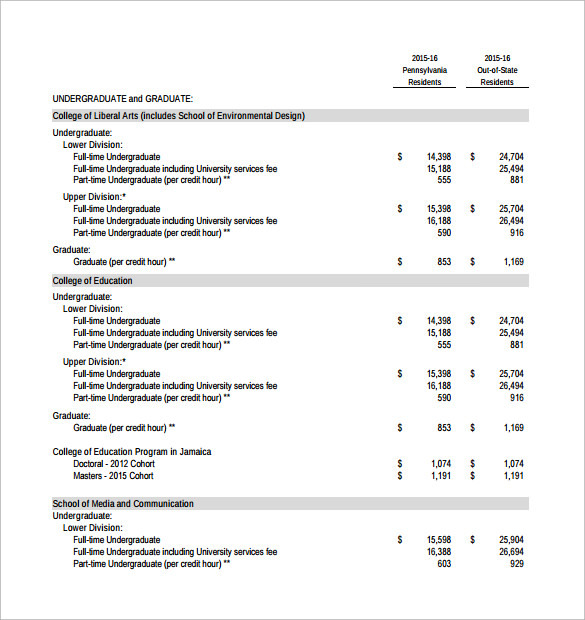 How These University Schedule Templates Will Help You? Planning a university schedule is not an easy task and one need to be very careful while designing the schedule for university, templates given here are very effective for designing each activity of the university. It is either classroom lecture planning or event planning; templates given here will guide you in details about how to plan the same effectively without clashing the resources and important event with each other. These templates are designed by experts to help you to manage the schedule of university effectively. You can easily download any of the required templates from here and can use it according to your requirement. 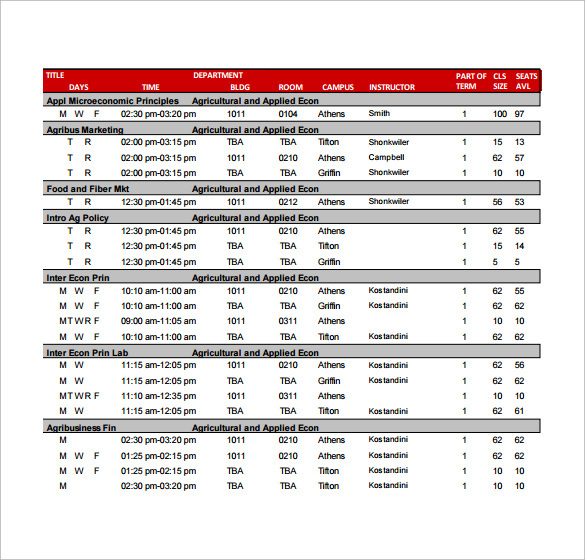 A good university schedule template automatically reduces the time and effort of scheduling for university. Templates given here are designed by experts to help educators to design the entire year’s schedule of a university in an effective manner.